well last week found me working very hard in here. 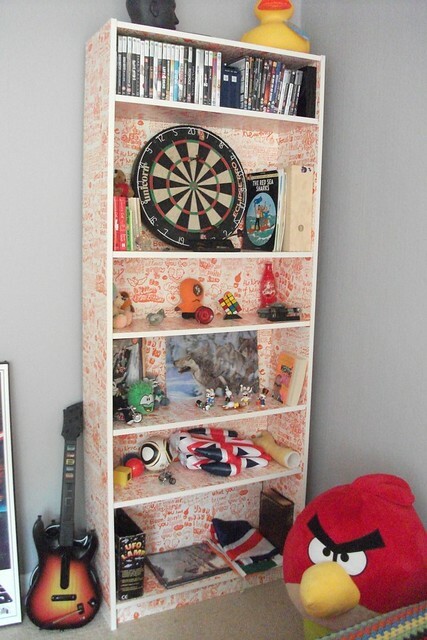 It was time for the teen room makeover! My son is almost fourteen now. This room used to be pumpkin orange! which was bright and exciting for a while, but now the walls are a warm grey colour and phew... it feels like a huge relief! I used welcome 181, by the little greene paint co. It's an eco friendly water based paint, with low voc. It feels a bit more durable than some eco paints, which really haven't lasted very long before chipping off. This is the wipeable matt. 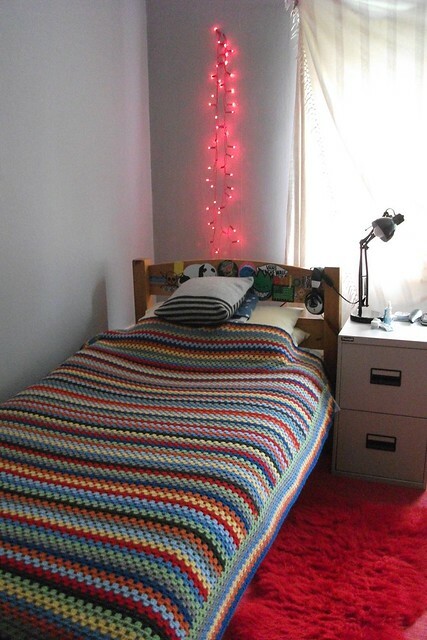 it's great to be able to decorate and then sleep in the room that night. I think the red lights look great against the grey and luckily we already had the red rugs. I just need to order a new white dim-out blind. The window is over two metres and I can't find any blinds to fit. Oh and a wall full of posters is on the agenda too! So I thought i`d take some pictures before it becomes covered in zombie posters....yikes! There is a great choice of posters at the PopArtUK Poster shop. The filing cabinett was a lucky thrifted find......and yes the crochet blanket was made by me, over last winter. 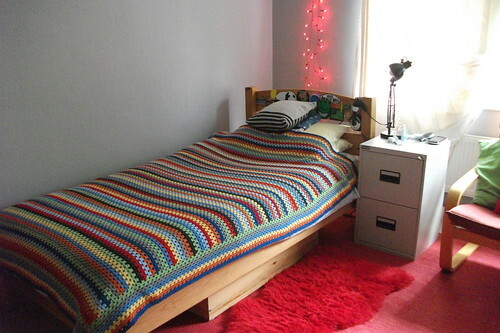 I absolutely loved making this granny stripe blanket. I just did not want to stop, so it's actually very long and covers the whole bed! It just adds that all important retro feel and cozyness. I have very high hopes for this blanket and I hope it will accompany him all through life.....it's handwash, 100% merino wool and I've already told him countless times that it will probably have to be washed in the bath and then layed out to dry on a hot day!....do not put it in the washing machine! !....but it does make for a lovely soft and warm blanket indeed. The shelves we previously had from ikea. I thought we might paint them or spray them but they are still ok adding a bit of colour and fun. The angry bird is essential kit! oh and the door needs re-hanging (don't ask! )......there is also a lot of talk about laptops and ipads going on.....there is a birthday coming up soon. I don't know about you but I just love transforming a space. I know it doesn't solve all of lifes problems, but its got to help, and it feels good to be in a clear, fresh, de-cluttered room that's for sure! just wonder how long it will stay like that....as for the stuff that came out, it's all in the loft. Difficult to part with precious things so I guess that's a job for another day. .... I think he's very lucky don't you? he's also got a pretty decent sized room. Just this morning I read about a family of 11 children, triple bunk beds an all! The family share 4 computers, they are home-schooled oh and the mum writes a blog! we have enough trouble sharing one computer between two!